Who needs a form INZ 1017? 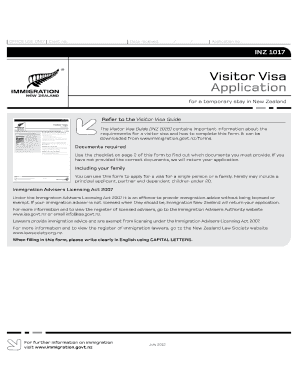 Form INZ 1017 is an application for receiving a visitor visa to New Zealand. 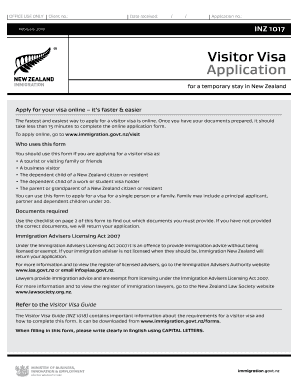 There is a chance that you may not need to file this form before going to New Zealand. It depends on your citizenship. The official government website provides a list of countries the residents of which need only a passport and tickets to go New Zealand on vacation. You can check if you need to apply for a visa here. What is form INZ 1017 for? 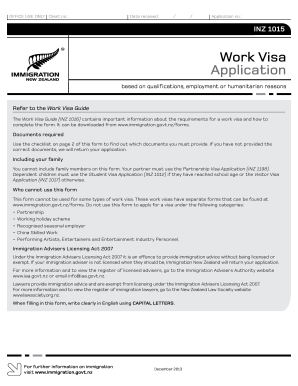 The main purpose of this application is to provide all necessary information to New Zealand foreign affairs authorities, so the officials can issue a visa to eligible applicants. A visa is one the most important travel documents. If your application has been approved, it will be easier to obtain other travel documents. When you head to other countries, it’s important that your eligibility for a visa has been already verified. You have to provide two color passport photos, a passport that will be valid for at least three months after you leave New Zealand, and a return ticket or enough money to buy one. You must also have NZD 1000 per month or NZD 400 per month if you have already paid rent for you accommodation in New Zealand. Other than these requirements, some applicants need to provide chest X-rays and other medical certificates. You can read more about whether you should file those here. When is form INZ 1017 due? Remember, it can take three weeks or more to process your visa application, so plan your visit and send the documents in a timely manner, taking this period into consideration. How do I fill out a form INZ 1017? This is a big application, so it can take a while to complete it. Answer all the questions to the best of your knowledge. Fraudulent information may result in declining your visa application. There are 17 pages to provide full bio about you and members of your family. You can ask questions about your applications on the government website. File it with the New Zealand embassy or consulate in your area. Oct 23, 2015 ... Chest X-ray Certificate PDF [209KB], 1096, Mar 2015 ... unless you are a person who must use the Limited Medical Certificate (INZ 1201). Mar 30, 2015 ... You may require a Chest X-ray certificate (INZ 1096). ... is a requirement for you, please download our leaflet Health Requirements (INZ 1121).